Blazers, a few decades ago, were formal, thick – and a little boring. However, the scenario has changed dramatically. Blazers are blazing into a whole new dimension, something we didn’t quite see coming. While formal blazers now have a ton of new trendy additions, the informal ones are a different ball game altogether. And, that’s why we see an increasing number of women sporting these. If you are trying to explore this, we have everything a beginner needs to know about how to wear a blazer. Blazers come in all colors, prints, cuts, and fabrics, and your options now are practically endless. Whatever it is that you choose to go for, you need to know the basic styles and understand how to buy them. Every brand has its own take on these, but the fundamentals remain the same. Let’s take a look at them. A single button or single-breasted suit essentially has one button that connects the sides of your blazer. This style suits all body types and occasions. Choose fabrics and styles that are slightly informal if it’s not for work. This style has been in fashion for over 70 years now. Two buttons blazers are extremely formal, and more popular than your regular/single button blazer. It has more fabric and covers your shirt, unlike the single button ones. People are moving out of the single-breasted blazer wagon because the idea of a formal blazer has changed over time. 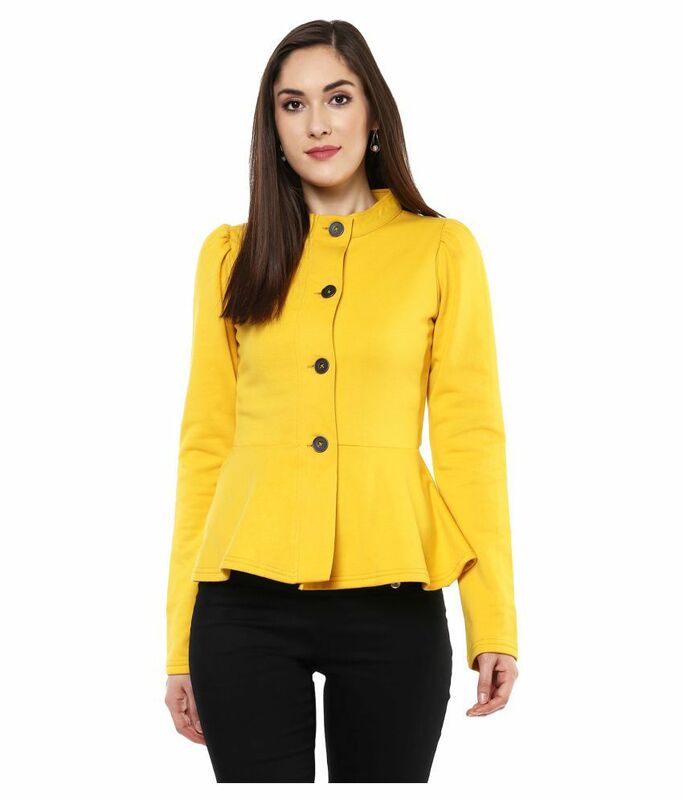 Peplum blazer is incredibly fancy, and takes the shape of the peplum cut. There’s something about this cut that makes these look irresistible. You get both elegant and formal variants in these. They look exceptionally good with formal skirts and pencil pants. Waterfall blazer is not a blazer per se, but this is more blazer than your shrug. It has caught on like wildfire. 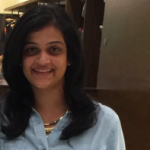 Officewear, power dressing, work look, etc. are evolving rapidly, and these are getting acceptable at work, and otherwise too. Blazers for work used to mean a complete matching suit, but that has changed now. While there’s nothing wrong with wearing matching suits, matching separates is the new thing. Pencil skirt and a white button-down shirt with a brown checkered single-breasted blazer looks dapper. Now, I’m sure you haven’t seen anything quite like this, have you? 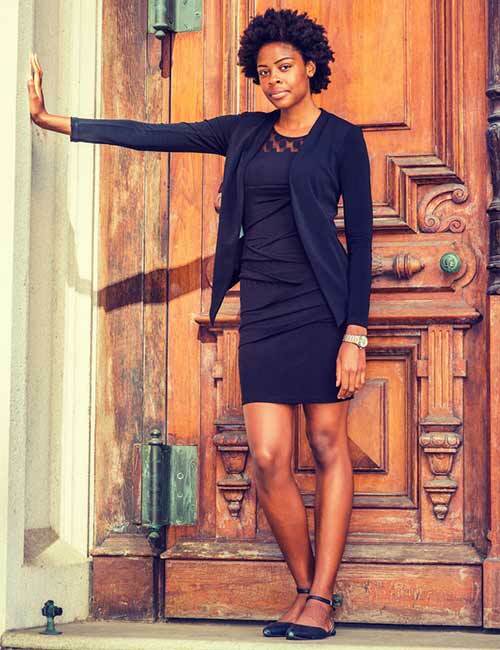 A short, draped blazer-style dress with a pair of bold red pumps is your way to go. If you are all about flaunting your legs in a skinny pair of jeans and pairing that with a blazer, go for a plain shirt, preferably white, and go all out with a casual blazer. Swap your jeans with a pair of leggings or jeggings to take the look a notch higher. Turtleneck T-shirts are uber cute and effortlessly stylish. So, how do you up this already stylish game? Just throw on a blazer of your choice. Completing this look with converse shoes will make the outfit quite the charmer. A crop top style-sequin blazer with a pair of printed pants will take your party look to a whole new level. If the blazer comes with a simple sequin bordering, go with a sequin tank top; or, just stick to basics like a tube or spaghetti top. Put your hair up in a chignon updo, and wear lipstick, wedges, and a sling bag. 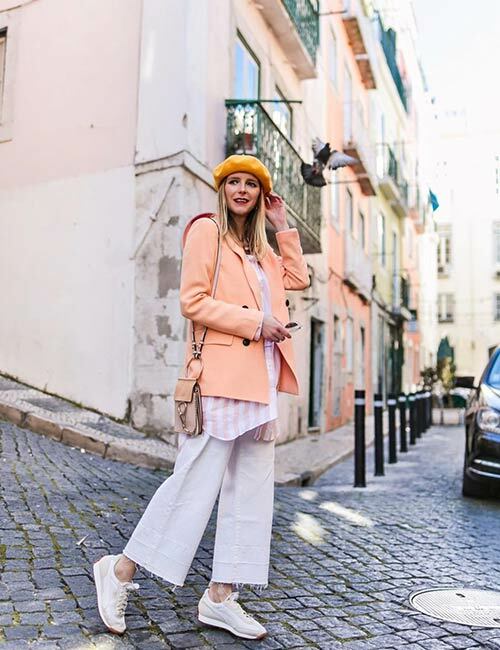 Throw on a muted pink blazer over your classic blue jeans-white shirt pairing and make it look like the world is your runway. Wear matching footwear and fine jewelry to complete the look. A pair of mommy jeans, a V-neck T-shirt, ankle strap transparent pumps, deep red lipstick, a high bun, and an oversized black and white blazer will set your mood right for a retro night. Bored of wearing one piece long or short dresses for weddings? Try the matching suit sets that have taken over the clothing lines over the last few seasons. The draped, tieable, waterfall style blazers look cute over a pair of well fitted, ankle length pants. But, if you are wearing white, make sure you check with the host or choose another color in this style. Denim jackets don’t pass off as blazers, but if you are a fan of the finish, chambray blazer is your way to go. They look stylish and go perfectly with denims, shorts, skirts or dresses alike. Fold the sleeves if you are a fan of quarter sleeves. Who says you cannot wear a blazer over shorts? Tuck in a plain V-neck T-shirt into light washed denim shorts, and wear a bandana or satin scarf. Finish the look with a pair of pumps, a small body bag, and tousled waves – slay it in style. Blazers with one piece dresses are increasingly becoming popular, and not just the formal kinds. Blazers in the waterfall style will make you look like someone who knows her dressing game. Your standard two-button blazer work look is the epitome of power dressing. 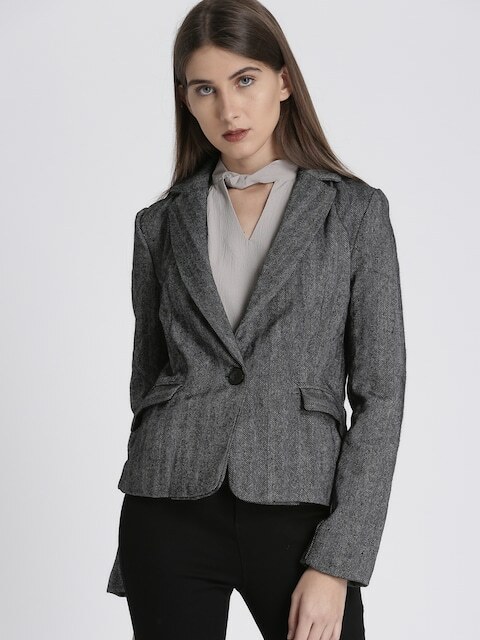 If you are headed to an important meeting or an interview, invest in a formal blazer like this one and wear it on days like these. Gray, black, blue, and checkered blazers are versatile and can be played around with depending on the rest of your outfit. So, it depends on how creative you can get, and how to make it seem new every time. Linen and pure cotton are making a comeback thanks to slow fashion and other fashion movements. If you are into sustainable clothing, cotton or prefer light cotton clothes in summer, a linen blazer will be a stylish addition. 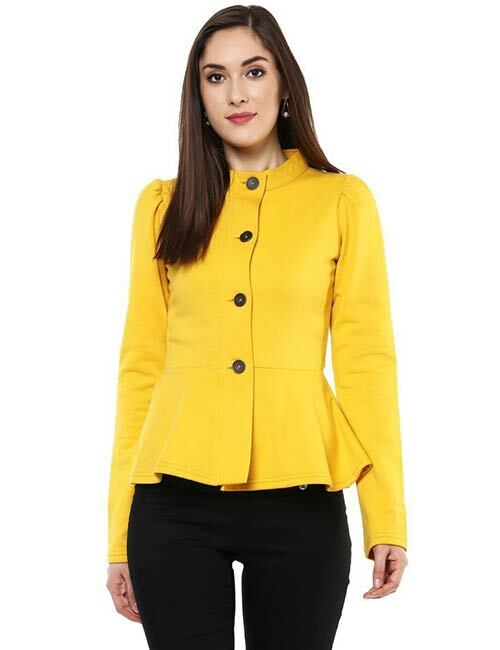 The idea of wearing a blazer over something that is well fitted and body defining has been the norm for the longest time. But, you guessed it right, that’s changing too. Adding a pop of contrast or coral colors to your culottes or palazzo pants is now considered cool. How did we not think of this before? A sweater inside and a suit outside? Remember that as long as it’s not outlandish and still stylish, power dressing has a lot of scope for you to explore. 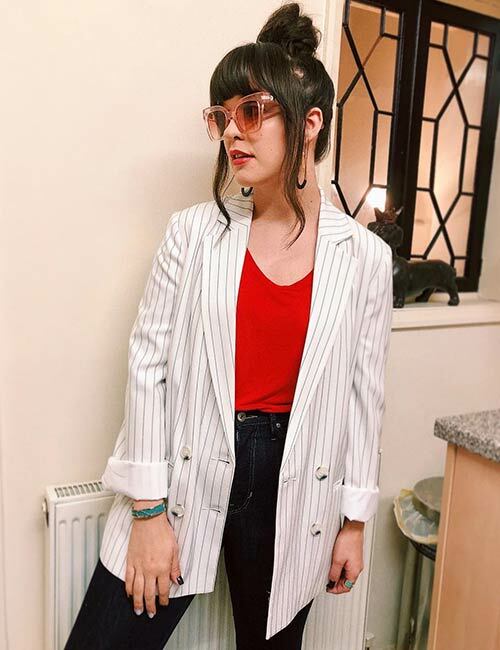 I do not know about you, but as I wrote this my urge to try some new styles from here MADE me purchase a couple of blazers I have been swooning over for some time now. What about you? Are you into this look or is it a Nay? Tell us by commenting in the box below. What is the difference between a blazer, a coat, and a suit? Blazers are usually stand-alone jackets that are considered formal, but they swing both ways depending on the fabric, pattern, and print. A suit is more elaborate, almost always used for formal and semi-formal occasions, and comes in a trousers-blazer combo. A coat is more like a jacket that is used in cold weathers and comes in all shapes and lengths. It can sometimes look like a blazer, but it is not one.